The communal economy relies on co-operatives. It aims to let society achieve self-sufficiency in basic life necessities. A society needs access to electricity without having to be exploited by the capitalists. 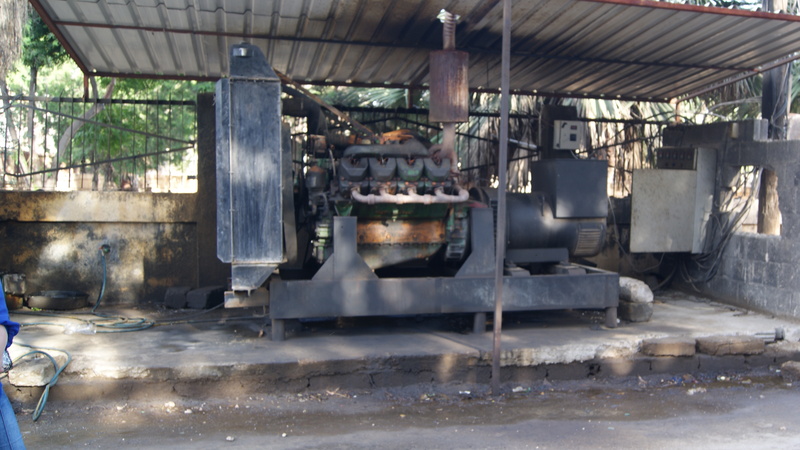 The main aim of this kind of co-operative in Rojava is to secure its members’ need for electricity without making a profit. Its most important goal is to let this co-operative become a paragon of communal spirit, and also to encourage the economic committees to make similar projects to serve common people and improve the economy. An electric generator co-operative is a co-operative society that generates electricity for its beneficiaries, who become members by buying shares. The estimated cost of the generator is what is required for the shareholders to pay. The number of shares in the co-operative is the estimated cost of the generator divided by the number of amps. The minimum number of amps a participant can buy is four. If a participant would like to buy 4 amps, then the price of a share should be multiplied by four. The maximum number of shares a participant can buy is ten shares. 1 – Every co-operative member over the age of 16 has the right to vote and participate in the meetings of the general conference. 2 – Beneficiaries can choose if they want to be shareholders or not. The number of shareholders shouldn’t be less than 25% of the number of participants. 3 – The shareholders start paying for their shares right from the beginning of the establishment of the co-operative. The payment can be divided into a maximum of two instalments. 4 – A shareholder can only have one vote, no matter how many shares they buy. 5 – The Board of Directors should charge the beneficiaries according to the prices set by the specialists. 6 – Members should pay by the 10th day of the month. If they don’t, then they should receive a notification. Electricity will be cut off if they don’t pay after the notification. 7 – Members can buy shares at the beginning of every month, whenever there are available shares, after the approval of The Board of Directors. 8 – Members can sell their shares to whoever they want, after the approval of The The Board of Directors. 9 – Members can cancel their participation and membership when they leave the neighbourhood. 10 – The Board of Directors should attend the regular and emergency meeting and carry out the tasks assigned to them. 11 – The minimum and maximum number of shares that can be bought should only be decided in the annual meeting. 12 – Only the Board of Directors have the authority to include new members and distribute electricity. 13 – Non participants cannot vote. 14 – The Board of Directors should secure electricity, no less than 200 watt, after the last participant. If the excess of consumption happens due to a fault in the switch, then the switch should be changed immediately by an electrician assigned by The Board of Directors. If it happens because the member changed the switch, then they should pay a fine no less than 10,000 SYP. If it happens again, the fine will be doubled. If a member hacks the generator’s network, without having to change the switch, then they should be barred from the co-operative for a month. If they do it again then they should be permanently barred, plus have to pay the fine. It includes of one member whose task is to collect the money from the participants, organise the financial records, make monthly and annual financial statements of income and expenditure, balance, deficits and the contribution of each shareholder. It is possible for the shareholders to form a committee to observe the procession of the work of the financial committee and check the statements of income and expenditure, in collaboration with the other committees. – The Board of Directors hold their regular meetings every month to execute the final decisions of the General Assembly, and to check the technical reports and financial statements. – The co-operative opens a bank account. Money can be taken and put into the account after the approval of the Board of Directors. – The General Assembly of the co-operative holds its meeting every three months. All members should be informed about the date and place of the meeting. – The financial and technical committees can hold their meeting whenever it is necessary. 1 – Indirectly, by reducing the costs. 2 – Every six months, the profit is added to the capital pool to pay for maintenance and emergencies. The shareholders get 50% of the net profits, and the Board of Directors get 10-15%. Each member of the Board gets paid according to how much they have worked. The pay should be from 500 to 30,000 SYP per individual. The House of Co-operatives gets 5% of the net profits. The Board of Directors has the authority to bar those who breach the rules of the co-operative or don’t pay the monthly fees for two consecutive months, or do anything that damages the co-operative. All the shareholders get together once a year to elect a new board of directors democratically, and in a direct secret voting. Every member with financial clearance is entitled to stand for election and vote. The conference is legitimate only if more than half of the members of the co-operative attend; half plus one. The Technical Committee, which consists of two or three members who have technical expertise of electric generators. The Administrative Committee, whose task is to supervise the working of the Financial Committee and manage the emergency meetings, examine the financial statements to prepare them for the final annual statement, and submit it in the conference. Only the conference has the authority to liquidate the co-operative. To be quorate, at least 60% must be present for the vote. If they vote yes then all the assets should be sold in a public auction under the supervision of the administrative and financial committees, and a representative of the House of Co-operatives should be present as well. The whole capital should be distributed equally among all the members, each according to how many shares they have in the co-operative.